Every organization these days prefer to have its own website. Websites are indispensable in case of marketing organizations or online marketing service providers. The websites used by such organizations have a specific requirement in terms of their appearance and feature. WordPress has various themes that serve the requirements of such clients. 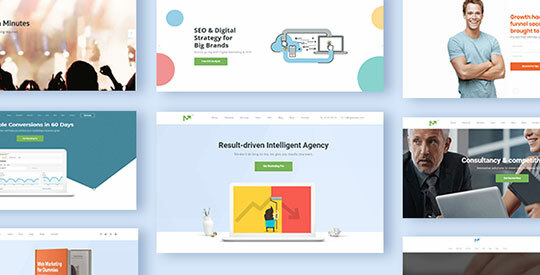 We have shortlisted some premium WordPress themes that are considered most suitable for marketing purpose. Marketing Pro is an all-purpose theme designed by WordPress to meet the need of big and small niches in the digital world. The theme is equipped with 9+ templets that can be used while designing the website. These templates are very beautiful and highly convertible. The theme provides you with a drag and drop-down feature that enables you to customize the previous design of the theme as per your requirement. The flexible landing page layout and event or conference layout are no less than a bonus that comes along with theme template. 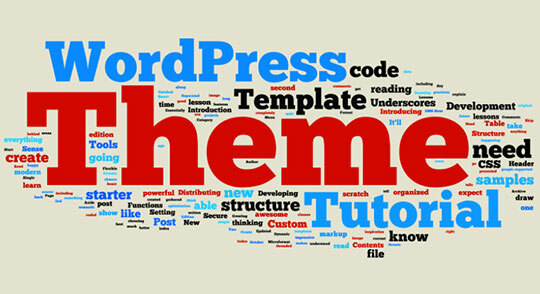 The shortcodes used in the template helps you to build your website from scratch. Live example/DEMO: You can check the demo of this theme here. This theme is best for the customers who prefer elegant looks. The readily pre-built library of layouts helps you to deploy your website in just a few clicks. You can customize your websites right in front of your eyes in no time. 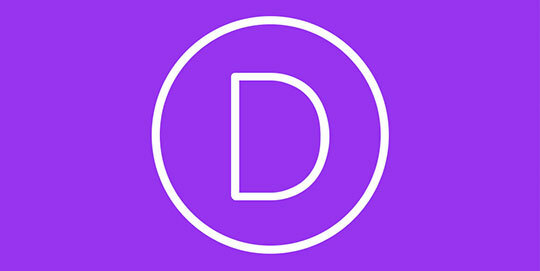 Divi is easy to access, very fast and easy to customize templet which is powered by Divi builder. The template is equipped with 46 content elements that help you to organize and recreate your website as per your wish. You can adjust the content instantly and adjust the website more quickly but switching to phone or tablet previews. Live example/DEMO: You can check a live example of Divi at MyHeritage Media Kit website. SEO WP was designed to meet the requirements of a social media website or marketing agency. 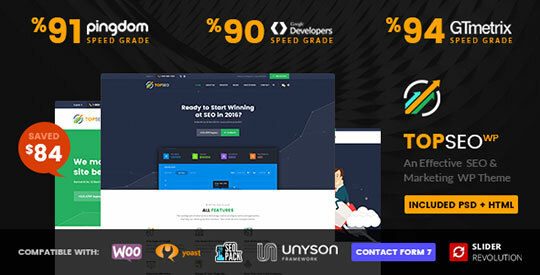 This theme provides a wide variety of header styles and layouts which makes your website unique. The system is designed with a new plugin for Live Composer. The simple catching out of the box design makes it easy to load your website on any server. Live example/DEMO: Check the live demo of SEO WP here. 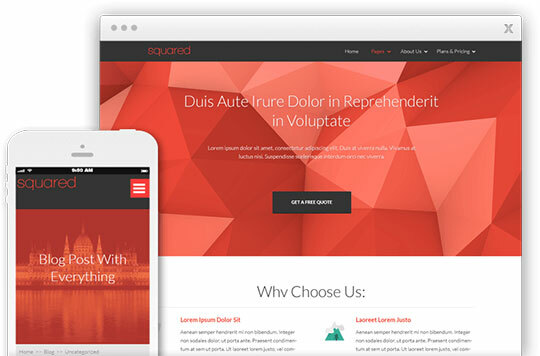 This bold and beautiful theme is best to attract huge internet traffic. 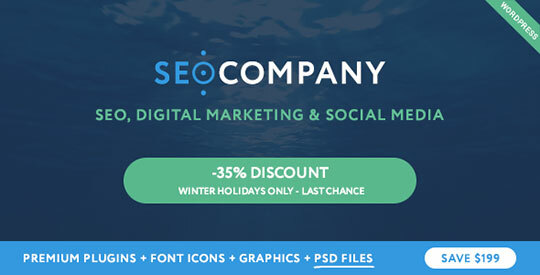 The theme enables you to create fabulous blogs, sales pages, highly convertible landing pages, supports the easy flow of social media sharing, and much more. The unique design of the template is so attractive that one cannot resist the temptation of revisiting the website. This theme can be switched in 6 different colors. If you looking forward to making one of the most attractive websites this theme is just for you. Live example/DEMO: Baba Support is currently using this theme on their live website. This theme is designed with latest trends and technology. Its fresh and modern look will surely make your website catchier. The theme is equipped with many eye-catching features like fabulous layouts, a number of blog patterns, Project Styles, Parallax Scrolling and many such features. It has a flexible structure and can be easily customized. 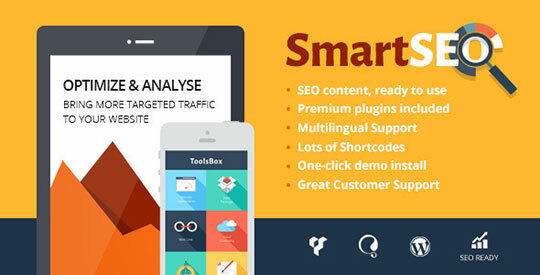 Live example/DEMO: Check the SmartSEO demo here. Recommended for you: Divi Vs. Avada – Which Premium WordPress Theme is the Best Choice? Yamoto is a theme specially designed for corporates. Its stunning corporate look is a statement in itself. 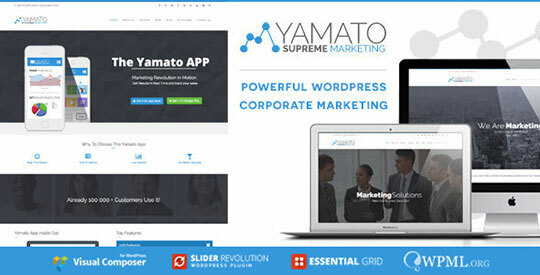 Yamoto is equipped with all the premium plugins offered by WordPress. It has everything you need to build a corporate marketing website. The theme is equipped with detailed documentation and video tutorials. It is also supported by a premium support forum that helps you build a website as per your requirement. Live example/DEMO: Before download, do not forget to check the demo of this theme. 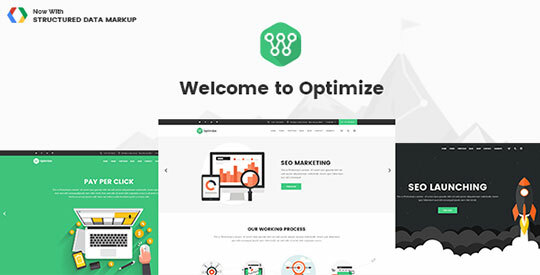 Optimize comes with 12 distinct homepages that one can use as per the requirements. The theme is compatible will all high-end SEO and analytical plugins. 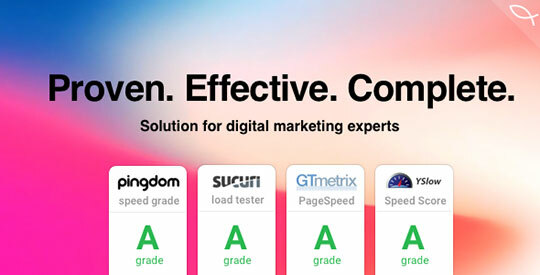 With plugins like Yoast SEO, Yoast Analytics, All in one SEO and Rankie the website will be easily optimized, analyzed and ranked all at the same time. The drag and drop plugin helps one create beautiful webpage as per his imaginations. Live example/DEMO: Creative Commons is currently running this theme in their “State of the Commons” subdomains. 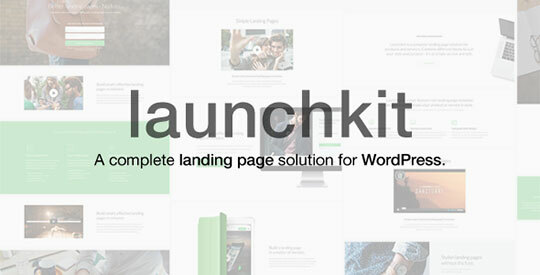 Launchkit is the best theme used to create opportunities for visitor conversion. It provides a complete landing page solution. With its unlimited potential and marketing appeal, Launchkit helps one to create balanced content and attractive website both at the same time. Launchkit is equipped with 3 header layouts, 7 footer layouts, and over 30 elements that help you build a custom page. Unlimited color schemes, over 600 fonts and customized logos will help you build a website like never before. Live example/DEMO: Here you can find the Launchkit demo. 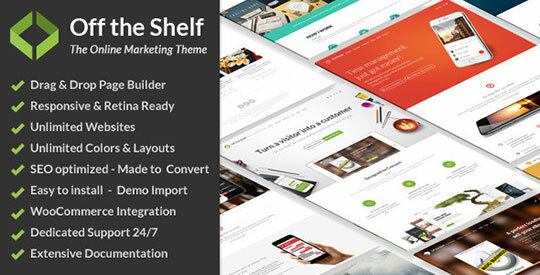 Off the shelf is an online marketing theme with a drag and drop page builder. The theme is not just flexible, fast and efficient but is also supported by professionals. The theme is suitable for all conversion optimized landing page, a modern blog or an online store. It is one of the most used online marketing themes by WordPress. Live example/DEMO: Here is the live demo this theme. This theme comes with a whiteboard feature which is commonly used by top SEO and marketing blogs. The whiteboard presentation in SEO Company uses the premium Slide Revolution plugin. The best part is you don’t have to any extra charges for this feature. The theme provides you with a drag and drop-down feature that enables you to customize the previous design of the theme as per your requirement. The theme helps you to display your social media feeds on your website. The design is appealing and connects to the target audience very easily. Moreover, full optimization helps to attract traffic to any search engine. Live example/DEMO: The live demo of SEO Company theme is available here. 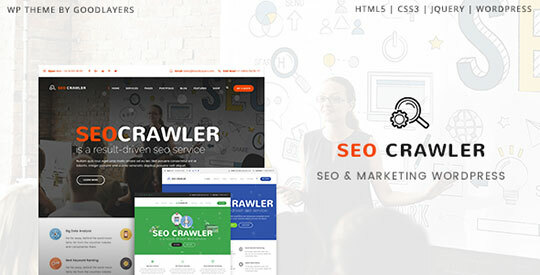 SEO Crawler is a theme designed for social media websites and marketing agencies. The theme has 3 pre-built in homepage layouts. You will also find a homepage slider which can be used to slideshow the key information about the business. The content template for the inner pages is also designed to high standards. Suitable layouts required to publish case studies, detailed service plans, landing pages for service promotion and profiles of the team members are also included in the given theme. The user is also provided with pre-built content for marketing websites and drag and drop plugin so that you can customize the website. Live example/DEMO: To check the demo of this theme please click here. TopSEO is a very well designed and clean coded theme that is suitable for all digital agencies. Along with all prerequisite features of professional themes, the website is faster in terms of loading and has a high google ranking. The theme supports features like slider revaluation and facilitates easy sharing on social media. It is highly optimized and has a mega menu and unlimited slide bars that fit all your requirements. Live example/DEMO: You can find the demo of TopSEO here. Marketplus is equipped with a number of built-in modules and layouts that enables you to mix and match to get desired results. The theme is fully responsive. The responsive mode can also be put on and off as per the requirement. The theme also includes commercial Visual Composer plugin that is useful to customize your website. 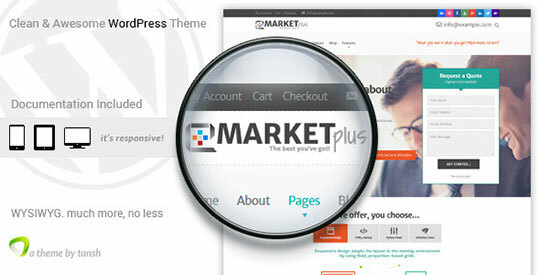 If you wish to revamp your website Marketplus is all in one solution for you. Live example/DEMO: Click here to see the live demo of this theme. A website is the most important aspect of an online business. The more catchy the website the more you will attract internet traffic. Hence, it is necessary to build a website that speaks to your business. Go ahead and customize your own websites with the all-attractive themes offered for WordPress. Visual perception is a very important factor for the audience! Your traffic will go through the roof within days of setting up a new theme if do everything the right way of course. Therefore, the improvement of the behavioral factors. I found the best WordPress portfolio themes and I can confidently say that it’s worth it.